I, and I assume you too, am always on the lookout for new origami paper. I've gotten most of my stock from a certain giant crafts store near me. They only have about five different varieties. So naturally, I've been on the hunt for a much larger source. Would you recommend a good online store for paper? I also do love this transparent paper you use here. Is this 'elephant hide' something that can be purchased online somewhere? P.S. 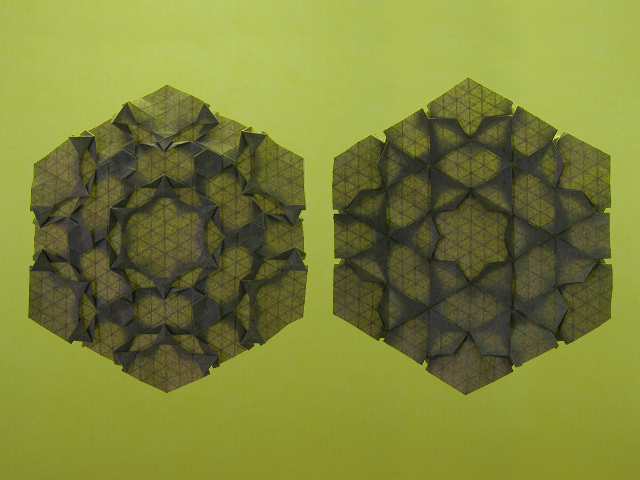 I just ordered the book 'Origami Tessellations' by Gjerde, and it should be shipping within a day. Looking forward to it! Elephant hide isn't transparent at all, actually. This one has a paper weight of 110gsm, and is thus quite heavy. Only with back lighting do you get a slightly transparent effect. I haven't really bought paper online. That is, I have bought some paper from http://www.origami-s..., but nothing that I'd use for tessellations. Thus far I've folded tessellations from pergamyn (40gsm) and elephant hide (110gsm). Both have their advantages and disadvantages, and I usually decide on which paper I use depending on the model. I'll go look those up right now! Thank you, it helped quite a bit! Sara i wanted to buy somethong online from origami shop and i want to buy something more with about 20 euros and i can't decide what to buy . I stuck between the origami tesselletions and the origami polyhedra which one do you advise me to take ? is it possible to change euros to american money? Just ask your bank (or your parents). If you buy stuff with a credit card and such, the conversion is done automatically. Do you think so, Sara? I don't think the "Negative Space Stars" is harder than "Aztec Twist", so I think you're up for it. What size grid did you use for this model? I think I started with a grid with 32 divisions.